With temperatures soaring this week, you might be worried about your baby overheating, especially at bedtime. Follow these tips and recommendations for battling the heat and keeping your baby comfortable during these summer nights. Figuring out how to get your baby to sleep can be a trying task at the best of times, but with this sweltering summer heat, you have added worries about the risks of overheating at night. According to the Lullaby Trust, the ideal room temperature for sleeping babies is 16-20°C, but during a heatwave like this, how can you make sure this is the case? The Lullaby Trust has some ‘summer rules’ for baby sleep, including lighter bedding and clothing, and opening doors and windows where possible to facilitate airflow. Make sure you are only using light cotton bed sheets in this heat and try to avoid waterproof mattress protectors as these can cause your baby to sweat. Just like you, on hot days your baby needs sufficient fluids: you can give cooled boiled water to bottle fed babies under 6 months, and tap water to bottle fed babies over 6 months. Fully breastfed babies won’t need any extra water, though. There are several easy ways to cool your baby’s room, and having a room thermometer to eliminate guesswork is handy. If you want to use a fan in your baby’s room, make sure it is not aimed directly at the child. Lucy Shrimpton, the Sleep Nanny, recommends placing a large bowl of ice in front of the fan to cool the air being circulated. Lucy also mentions putting big bottles of frozen water in the room to cool the air as they melt. Give your baby a lukewarm bath before bedtime to help refresh them before settling in to sleep. 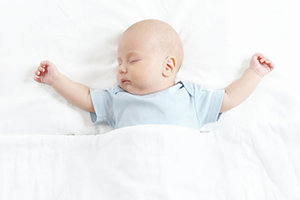 Read more safe sleeping tips for babies. The Lullaby Trust recommends that the best way to check your baby’s temperature is to feel the skin on their tummy or the back of their neck. If the skin feels hot, you can remove a few layers or try to cool the room further. It is also good to have a digital thermometer on hand to give you a quick indication of any issues. An uncomfortably warm temperature can disrupt your baby’s sleep and cause them to become irritable, so you may find that your baby is more restless and prone to waking on warmer nights. With both of you hot, bothered and tired, this can make for an especially frustrating situation. It’s important to remember that you’re not alone – of 800 parents who mentioned sleeping issues in our 2015 Baby Survey, 69% reported some issue with babies either not self-settling or taking a while to settle to sleep. 26% said that their babies would wake up and not go back to sleep. You can find out how much sleep your baby needs and when babies start sleeping through the night in our guide to baby sleep training.